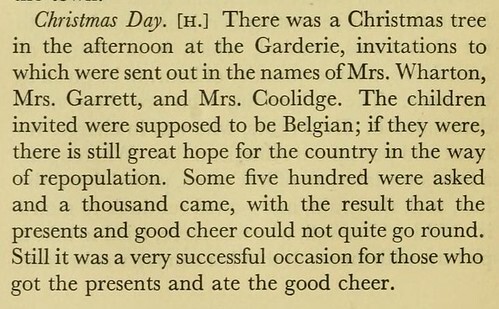 With December 25th fast approaching we have put together a little collection of entries for Christmas Day from an eclectic mix of different diaries spanning five centuries, from 1599 to 1918. Amid famed diarists such as the wife-beating Samuel Pepys, the distinctly non-festive John Adams, and the rhapsodic Thoreau, there are a sprinkling of daily jottings from relative unknowns – many speaking apart from loved ones, at war, sea or in foreign climes. All diaries are housed at the Internet Archive – click the link below each extract to take you to the source. John William Polidori and William Michael Rossetti – Source. From Journal (1835) by Mary Kemble – Source. 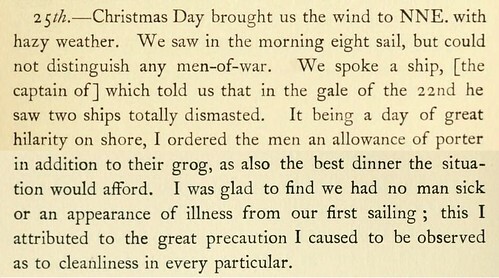 From Journal of Captain Solomon H. Davis, a Gloucester sea-captain, 1828-1846 (1922) by Solomon Haskell Davis – Source. 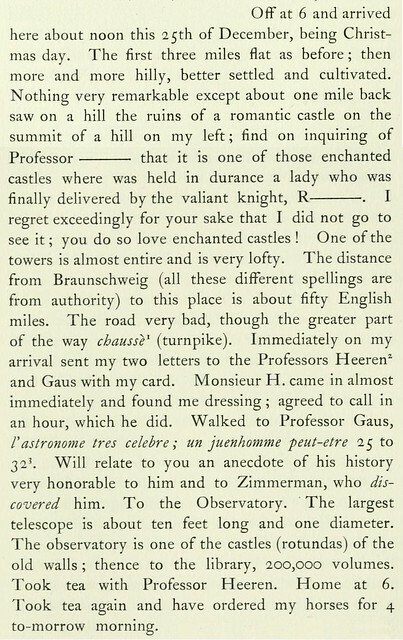 From Memoirs, journal, and correspondence of Thomas Moore (1853) by Thomas Moore and Earl John Russell – Source. From From the deep of the sea; being the diary of the late Charles Edward Smith, M.R.C.S., surgeon of the whale-ship Diana, of Hull (1922) by Charles Edward Smith and Charles Edward Smith Harris – Source. From My war diary (1917) by Mary Alsop King Waddington – Source. From Napoleon at St. Helena (1888) by Barry Edward O’Meara – Source. From Andersonville diary; escape, and list of dead, with name, company, regiment, date of death and number of grave in cemetery (1881) by John L. Ransom – Source. 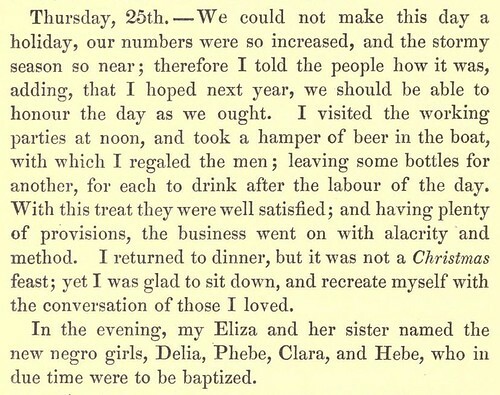 From Diary in Turkish and Greek waters (1855) by George William Frederick Howard, Earl of Carlisle – Source. 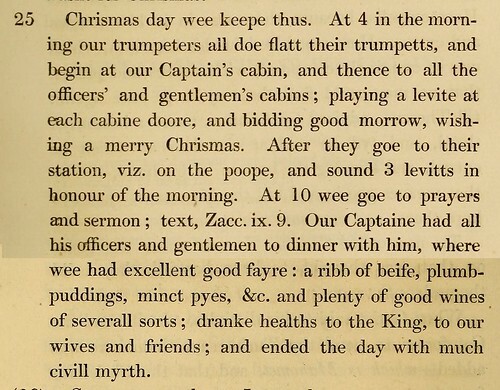 From The diary of Henry Teonge (1675/1825) by Henry Teonge and Charles Knight- Source. From The diary of Orville Hickman Browning (1925) by Orville Hickman Browning – Source. 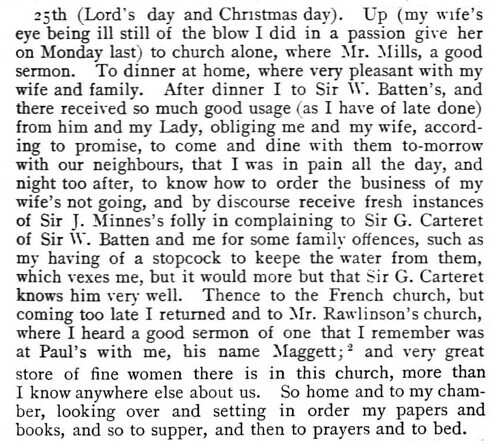 From The Diary of Samuel Pepys (1664/1893) by Samuel Pepys – Source. From Diary of Mary countess Cowper, lady of the bedchamber to the Princess of Wales, 1714-1720 (1864) by Countess Mary Cowper – Source. From The diary of the Right Hon. William Windham, 1784 to 1810 (1866) by William Windham and Cecilia Baring – Source. 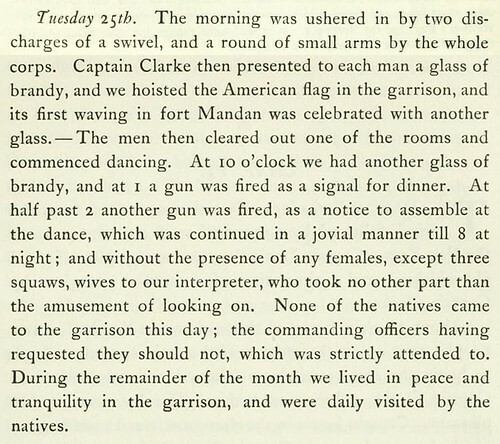 From Dyott’s diary, 1781-1845; a selection from the journal of William Dyott, sometime general in the British army and aide-de-camp to His Majesty King George III (1907) by William Dyott and Reginald Welbury Jeffrey – Source. From Early voyages and travels in the Levant (1599/1893) by Thomas Dallam, John Covel, and J. Theodore Bent – Source. 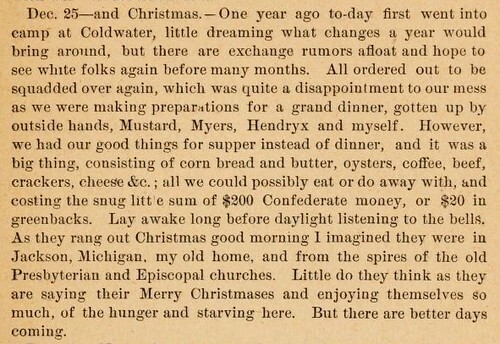 From Gass’s journal of the Lewis and Clark expedition (1904) by Patrick Gass and James Kendall Hosmer – Source. From Manuscripts of the Earl of Egmont: Diary of Viscount Percival afterwards first Earl of Egmont, 1730-33 (1920) by Ear John Percival – Source. 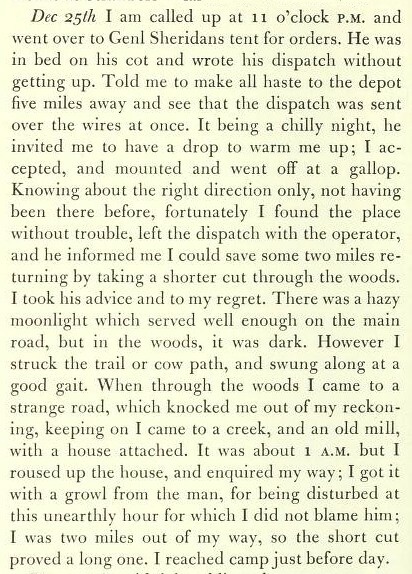 From Memoirs of John Quincy Adams, comprising portions of his diary from 1795 to 1848 (1874) by John Quincy Adams and Charles Francis Adams – Source. From The new journal of Marie Bashkirtseff: from childhood to girlhood (1912) by Marie Bashkirtseff – Source. 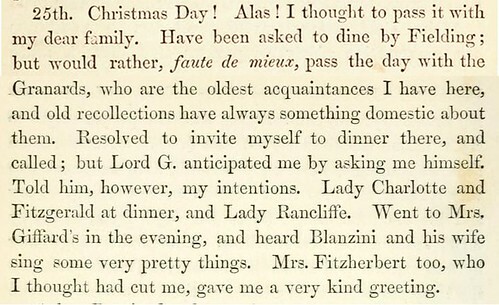 From A portion of the journal kept by Thomas Raikes, esq., from 1831 to 1847 : comprising reminiscences of social and political life in London and Paris during that period (1858) by Thomas Raikes – Source. 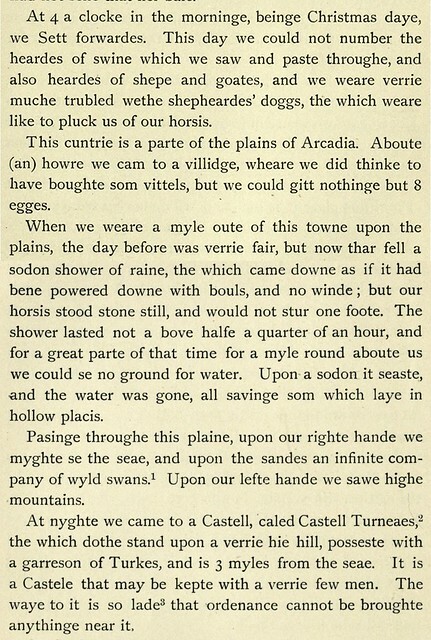 From Sir Edward Seaward’s narrative of his shipwreck, and consequent discovery of certain islands in the Caribbean Sea: with a detail of many extraordinary and highly interesting events in his life, from the year 1733 to 1749, as written in his own diary (1841) by Sir Edward Seaward, Jane Porter and William Ogilvie Porter – Source. 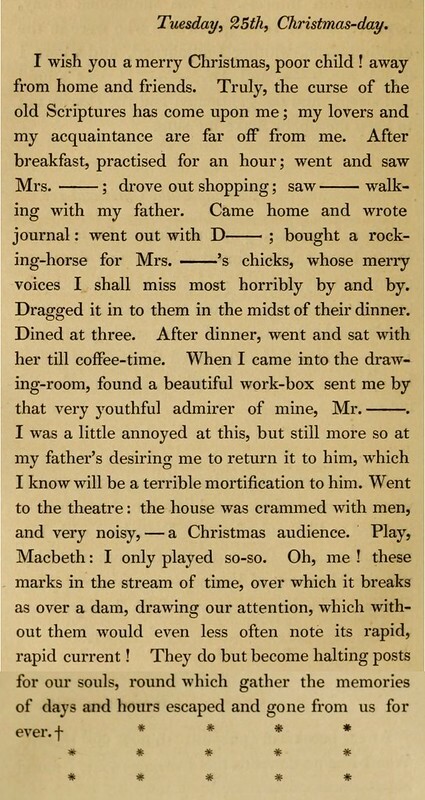 From The private journal of Aaron Burr (1903) by Aaron Burr, William H Samson, and William K. Bixby – Source. From Private Smith’s journal; recollections of the late war (1963) by Benjamin T. Smith – Source. 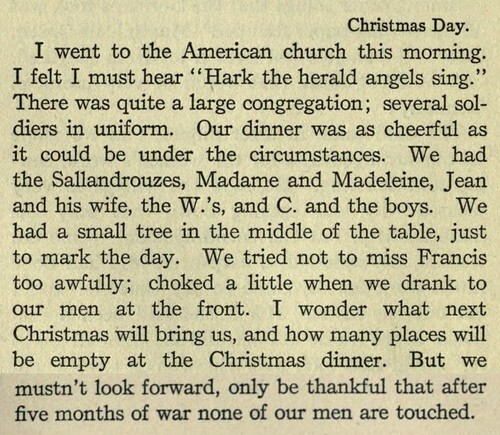 From A war diary in Paris, 1914-1917 (1931) by John Gardner Coolidge – Source. 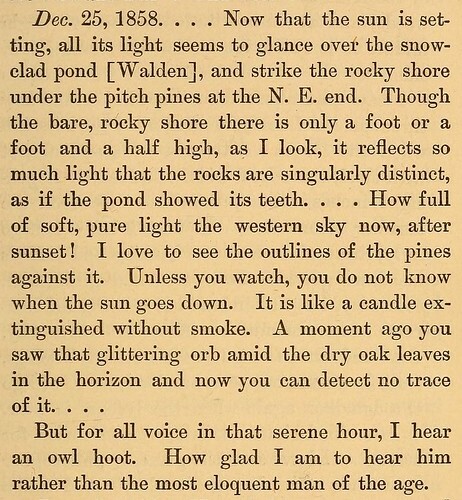 From Winter: : from the Journal of Henry D. Thoreau (1888) by Henry David Thoreau, H. G. O. Blake, and Jacob Chester Chamberlain – Source.